Twenty months. That’s how long Andrew Luck, QB for the Indianapolis Colts, will go between NFL appearances — if, as anticipated, he starts on opening day in September. Since leaving the field following a 24-20 win over the 3-13 Jacksonville Jaguars, Luck has seen GM Ryan Girgson and Head Coach Chuck Pagano get fired, undergone surgery on his right shoulder, and seen the Colts plummet without him to the bottom of the standings. The last team he beat went to the AFC Championship last season. Things change quickly in football. Luck is now 28 years old, and the promise and hope of his first three years in the league has morphed into a fragile wish-fullness from neutrals and fervent prayer and anxiety from Colts fans. The last years have seen a regression in Luck’s overall play, and coupled with some serious injuries – besides the prolonged surgery and recovery from shoulder surgery, Luck also suffered a lacerated kidney in the middle of a game, yet somehow kept playing – the last three years have been a slow motion train-wreck. Now, ahead of the 2018 season, Luck faces a season of uncertainty and hope as the Colt’s move on from the Pagano era. It’s probably best that owner Jim Irsay did finally, belatedly, fire Pagano on the heels of a miserable 4-12 season. For much of Luck’s career, the bumbling duo of Pagano and Grigson failed to have even a modicum of commons sense. Draft picks washed out at an alarming fast rate, Luck’s shoulder was mismanaged horribly, and the play on the field can be summed up in the worst fake punt of all time. By the time Grigson left, he was so hated that punter Pat McAfee said “Whenever he got fired, I was real excited. It was a great day in my life,” and “The only way the Cleveland Browns could get worse, they brought him in,” and “I think they should just send him to Canada. I think it would be great news for everybody”. Without Luck last season, everything fell apart. A record of 4-12 doesn’t show the whole story. Pagano started the year with the Scott Tolzin as his starting QB, a mistake that manifested itself in a 46-9 loss to the Rams in Week 1 where Tolzin went 9-18 for just 128 yards and threw two interceptions. A switch to Jacoby Brisset, who started the season as the Patriots 3rd string to QB, failed to stop the disaster. The Colts were blown out by good teams, blew games to bad teams, and finished 30th or lower in scoring offense, scoring defense, offensive yards gained, and offensive yards allowed. Irsay belatedly (about two years too late) fired Pagano this offseason, and hired offensive coordinator Frank Riech, coming off a Superbowl win with the Eagles, as the new head coach. Still, scars remain. The lack of talent and depth on the roster is frightening, and shows just how poorly Grigson and Pagano drafted during their time with the team. 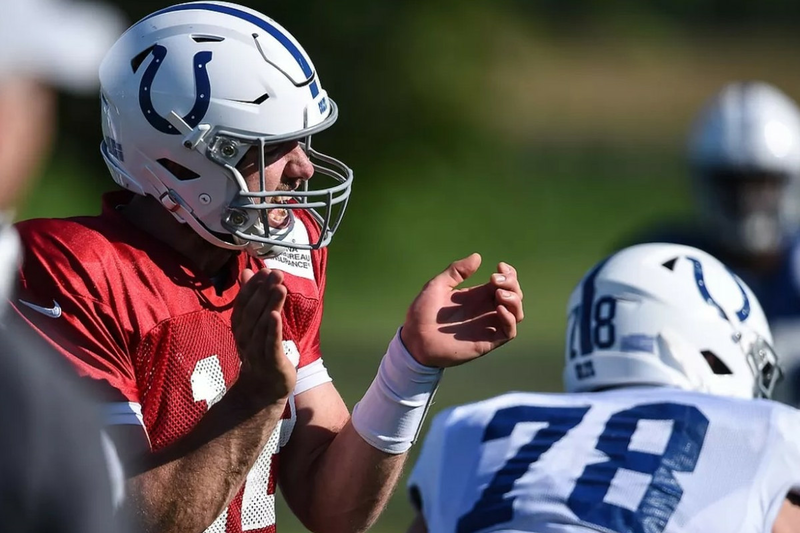 If Luck is to succeed this season, as before, he will have to carry the team on his back again, dragging along a plain roster towards glory nearly all alone. Nearly, because the Colts have begun to move their team in the correct direction. Reich was a brilliant offensive coordinator, and designed a cunning, explosive offense around a very talented QB (Carson Wentz) and misfit pieces that were cast and thrived in specific roles (Nelson Aglohor at WR, the Blount-Ajay combination at running back). Already in the short time that he has been with the Colts, Reich has made several moves that will drastically improve the team. First, Reich has attempted to make Luck safer and keep him on his feet more by investing in the offensive line, something that Pagano failed to do and lead to Luck being sacked 156 times over 70 games. Matt Saulson and Austin Howard were signed to short deals to protect Luck this season. Most importantly, the Colts selected Notre Dame guard Quenton Nelson with their first round pick. Punishing is too kind a word for Nelson’s play; more appropriate would destructive. All you have to do is watch this 2 minute YouTube video2 minute YouTube video of Nelson’s best blocks to realize he has the potential to be All-Pro for the next decade. Reich also reinforced other units. Most of the focus was correctly on the defense – at least the offense has Luck – but some additional resources were spent on the offense. Eric Ebron forms a perfectly complemented pair of tight ends with Jack Doyle, and the ex-Lions player is a excellent receiver on intermediate and deep routes. Finally, Reich drafted two running backs and two wide receivers in the later rounds of the draft. If one of them can contribute this season, that is just an added bonus. Everything still depends on Luck, on his shoulder’s health, and how fast he can re-acclimate to the rigors and pace of the NFL. This season might be difficult and rocky, but Reich and Luck can build a solid foundation to build from. And, if Luck can recapture his form of the first three years with the Colts, then his talent might be enough to compete in the AFC South. Either way, when he steps onto the field on September 9th versus the Bengals, Luck will finally be healthy. Given the past few years, every football fan should be grateful to watch him compete again.